Montreal, Quebec, Canada, January 11th, 2017 – MONARQUES GOLD CORPORATION (“Monarques” or the “Corporation”) (TSX-V: MQR) (FRANKFURT: MR7) is pleased to report new results from the current 10,000-metre drilling program on its Croinor Gold project, 70 km east of Val-d’Or, Quebec. Hole CR-16-506 was drilled on Section 770W (see section), and intercepted three shear corridors containing gold veins. 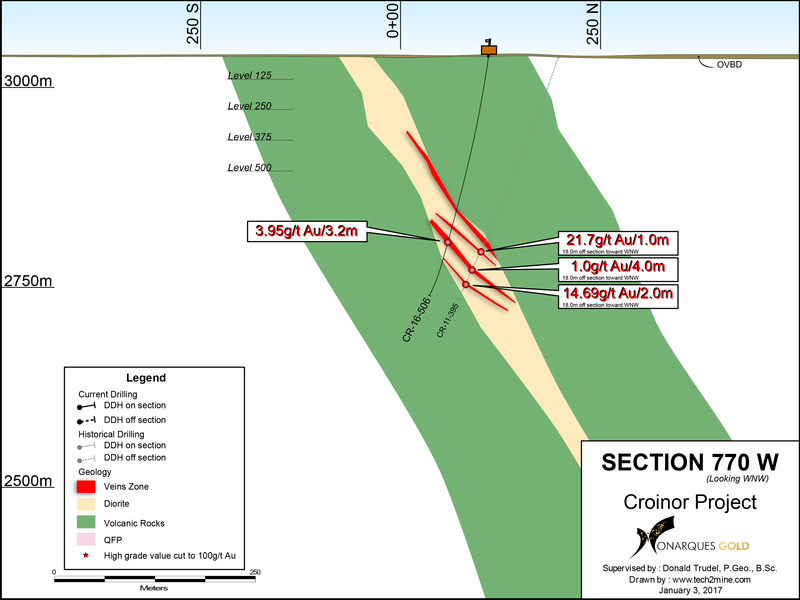 One of the veins returned 3.95 g/t Au over 3.2 metres, including 15.7 g/t Au over 0.7 metres at a depth of 230 metres, which would appear to support the presence of multiple high-grade gold structures in the western part of the Croinor Gold deposit. Historical hole CR-11-395 had returned values of 21.7 g/t Au over 1.0 metres and 14.69 g/t Au over 2.0 metres in gold structures located at 18 metres southeast of Section 770W. All lengths are identical to core length. There has been relatively little drilling done on the western part of the Croinor Gold deposit, between Sections 740W and 950W. Only one or two holes have been drilled on each section, with the sections spaced at 20 metres. Furthermore, the tops of the veins lie at a depth of about 175 metres. The Corporation considers the gold potential to be higher below that level, where the corridors and veins are more numerous and tend to be higher grade. The technical and scientific content of this press release has been reviewed and approved by Donald Trudel, P.Geo., B.Sc., the Corporation’s Qualified Person under National Instrument 43-101. Sampling normally consisted of sawing the core into two equal halves along its main axis and shipping one of the halves to the ALS Minerals laboratory in Val-d'Or for assaying. The samples are crushed, pulverized and assayed by fire assay with atomic absorption finish. Results exceeding 3.0 g/t are re-assayed using the gravity method. Samples containing gold grains are assayed using the metallic sieve method at the ALS Minerals laboratory in Val- d'Or. Monarques has established a full QA/QC protocol, including the insertion of standards, blanks and duplicates. Monarques Gold is a growing junior gold company focused on becoming the leading explorer and developer of gold properties in the Val-d’Or/Abitibi gold camp in Quebec, Canada. The Corporation currently has approximately 200 km2 of gold exploration properties (see map) along the Cadillac Break, including its main asset, the Croinor Gold mine, which has a great potential to become a producing mine. Monarques Gold is well financed and has close to $9 million in credits from Quebec’s Ministry of Energy and Natural Resources. The forward-looking statements in this press release involve known and unknown risks, uncertainties and other factors that may cause Monarques’ actual results, performance and achievements to be materially different from the results, performance or achievements expressed or implied therein. Neither TSX Venture Exchange nor its Regulation Services. Provider (as that term is defined in the policies of the TSX Venture Exchange) accepts responsibility for the adequacy or accuracy of this press release.